← What makes a poignant story? 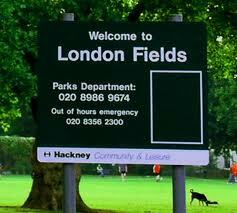 London Fields is not in west London as Amis suggests, it is a real place in Hackney, east London. Unlike Mrs Dalloway’s London, where you can still accurately follow in her footsteps today, Amis wrong-foots us so that we have to work out where we are and what is really happening. This is not a simple tale of an urban Arcadia despite the title’s implication that this might be the case. Having entered into an across-the-pond flat swap, Samson Young finds himself in Mark Asprey’s London home, ready to finally overcome his writer’s block, as the world rushes towards an uncertain new Millennium and he faces death from terminal illness. His two previous titles, ‘Memoirs of a Listener’ and ‘On The Grapevine’ appear to support his assertion that he ‘just can’t make anything up.’ He counts himself fortunate, therefore, when a perfect cast of characters enters his life to provide the dialogue, almost all the action, and the locations required to complete his murder story. The self-appointed Murderee, Nicola Six, has selected her thirty-fifth birthday as the day of her death because she cannot face the ageing process. As Guy Clinch walks down the Portobello Road, he sees it as a ‘whole trench scuffed and frayed, falling apart, and full of rats.’ Amis’s London is one where family life is disintegrating, and unspecified threats of nuclear war and climate change hang over everyone. The Black Cross has become a haven for Keith, Guy, Sam and Nicola Six and a space for dirty jokes and hatching plots. ‘If London’s a pub and you want the whole story, then where do you go? You go to a London pub.’ Keith Talent’s only talent is for playing darts and we can almost smell the stale air as his arrows fly across the smoke and gloom to thwack into the board. There is a good deal of black humour in London Fields. For example, when Keith is daydreaming about forthcoming riches and fame, he toys with the idea of himself as Keithcliff after reading a few pages of Wuthering Heights, but then they do share some character traits so perhaps it’s not so funny after all. The impossibly cramped flat where Keith and Kath live – although ‘live’ is rather too expansive a word for a space that produces such disproportionate violence – seems to crush any potential humanity. But it is out of this same space that the Angel of the tower block, baby Kim, emerges full of hope, truth and innocence. So, there is light at the end of the tunnel? Perhaps, but then there is the counterbalance in monstrous Marmaduke who, even at a very tender age, you would not like to meet down a dark alley. The product of a luxurious home with two of everything – except Marmaduke thankfully – we are forced to consider the question of nature versus nurture, and poverty versus plenty – or are we? I am taking a Creative Writing: Writing the City MA at the University of Westminster - just finished my first assignments (Jan 2012). I'll be making comments about this process as I go along. I am also a Buzan Licensed Instructor in Mind Mapping and Speed Reading. I live in Beaconsfield, Bucks and work in the South East and London. Martin Amis for me is a writer with a great many contradictions. There is no question he’s a skilled craftsman, with wonderfully lurid and blisteringly acerbic passages (to reel out the literary clichés on you all). But there’s something about Amis’ style I find constantly irritating. There’s a bitterness, envy, and snobbery in his tone that I just can’t enjoy even at my most misanthropic. I find this strange when I can enjoy Will Self, obviously influenced by Amis and similar in tone in may ways. Amis’ style and voice are certainly loud and clear in London Fields no matter how many unreliable and unseen narrators he puts between himself and the text (Young, and Mark Asprey, or ‘MA’ ho-ho ho). Is London Fields about the craft of writing as Anne suggests, or the story itself? Or is it one long and contradictory satire on the state of the 20th century. I think it is much more successful at the former two but have a sneaking suspicion Amis intended it to better achieve the latter (I read somewhere he wanted to call the novel ‘Millenium’ but that everything was called Millenium this or that at the time. Which puts paid a little bit to any extended analysis of the title!) The Millenium/20th century anxieties/obsessions and its symbolism was tiresome and heavy-handed – it was bad enough before I had Enola Gay and Little Boy needlessly and explicitly explained to me. Nicola became nothing more than an empty characterless vessel for this message in several sections of the book. The strength of the novel was in Amis’ attention to detail, his lyrical and baroque description of character and place. Frequently this was funny and evocative, or both. Only occasionally did I find it irksomely insincere or lacking authenticity. Intruding narrative voice (although Amis’ structure explicitly allows for that I still think it suffers from having too strong/obvious an agenda), characters as caricature, and London as an unreal place (London Fields in the west end etc) yet not fantastically unreal and adapted to a narrative purpose as in Neverwhere. I have to agree, the strength of the narrative for Amis lies in his detail. Right from the beginning we are given massive amounts of detail about Keith being a cheat, Keith not being good at racketeering, Keith playing darts. I will disagree with the tone being distracting. I appreciate the disdain that Amis appears to have for humanity. The cynical overtones that enhance and illustrate the characters make them believable and yet somehow caricatured. For example, do I really think Keith could ever exist? No. He’s just had too much go on with him. Too many punchups that should have been fatal, and too much straight success and straight failure. There doesn’t seem to be a grey area with this character that makes him real to me. While I did find the story engaging, and did enjoy the cynical overtones, I don’t think the characters are believable enough for me. I can’t tell if Amis is trying too hard to make them real or forcibly not giving them grey areas. I remember reading this book several years ago and being strangely drawn to it from the start. Its self-conscious references to plot and characters – and particularly ‘the murderee’ – made me like Amis, in spite of the author’s infamously dodgy ideas about class and gender. But should that influence our appreciation of a writer’s work? Are ethics and moral values really the currency by which we should evaluate and appreciate a writer’s craft? In 1997, in an article reminiscing about the Booker Prize’s history, Booker’s director Martyn Goff was reported remembering how back in 1989 ‘London Fields’ caused great controversy among feminists writers: “Maggie [Gee] and Helen [McNeil] felt that Amis treated women appallingly in the book. That is not to say they thought books which treated women badly couldn’t be good, they simply felt that the author should make it clear he didn’t favour or bless that sort of treatment”. My question is: is there really any character which Amis does not treat badly? For all I can see, Guy, Keith and Sam are all flawed characters, too. And, in fact, Nicola is the mastermind of it all, in her skilled manipulation of the male gaze and, in turn, her resistance to (masculine) authorial control.